Despite apparent demand, Crystal Dynamics says it has "no plans" to expand the single-player campaign right now. 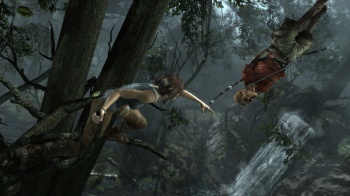 Tomb Raider is an excellent game, and one of its strengths is the sense of exploration it offers - there are plenty of locations to discover, items to find, and tombs to raid throughout the single-player campaign. One would think that future DLC might include additional areas or tombs to explore, but developer Crystal Dynamics has other intentions: the company has "no plans" to release any single-player DLC for the game in future. Global brand director Karl Stewart revealed the news in a Reddit AMA after several users asked about the possibility of single-player DLC. "There are currently no plans in place for any Single Player expansions. All of our DLC is based around the Multiplayer experience for now." When questioned on the rationale behind including multiplayer in a game that has such a strong single-player offering, Stewart said that the company honestly believed that it was the right thing to do. "This is our very first attempt to create a MP experience and with that comes a lot of learning. We will continue to monitor and tweak the experience until we get it right," he said. Multiplayer or not, the game is still getting plenty of attention. Stewart tweeted that the game had hit one million gamers in less than 48 hours of its launch, with millions more tombs raided, deer eaten and arrows retrieved, among other actions. If you're keen on more content, "Caves and Cliffs" is the latest DLC pack for Tomb Raider, and it adds three new multiplayer maps to the game. It's currently available on Xbox 360 for 400 MS points, and is coming soon to PlayStation 3 and PC.